A couple of years ago when we were in Hong Kong, we had dinner a couple of times at BLT located at Tsim Sha Tsui. I found this place a little pricey but the set up was lovely and the food was good. Altogether a great dinning experience. We'd usually have a milk shake with our burgers and a side of fries or onion rings. When it comes to milkshakes, I tend to lean towards fresh fruity ones while my husband prefers something chocolatey. We tried out a few of their amazing concoctions and loved every one of them. I miss those kind of milk shakes and so I figured I might as well try and replicate them at home. I mean, its a milk shake! It can't be that hard. Right? And you know what, I was right. 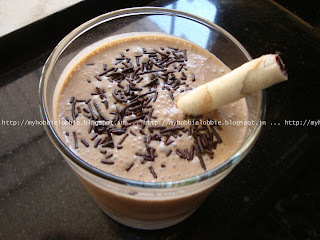 My first attempt was to replicate this milk shake called Monkey Business - fun name, don't you think? You can't go wrong with chocolate, bananas and peanut butter. Thats right! With a few basic ingredients on hand, you can treat yourself to this delicious shake in minutes. I used some chocolate sprinkles and a chocolate wafer to dress it up. Simply tempting and delicious looking milkshake. Wonderfully prepared. oh that sounds right up my alley, yummy! Thanks for the invite Lisa, I've linked up. Your linky party looks wonderful, I'm going over to check out the other entries! We love milkshakes and this is a flavor combo we haven't tried before. The sprinkles on top are a fun touch. Thanks Cathy, I hope you enjoy it! My daughter would go crazy over this milkshake. All of those things are her favorite ingredients and every time I use them she eats every bite. She sure has good taste Elsa, thanks for stopping by and enjoy the milkshake!!! It has all the right ingredients to be a winner in my family Trisha! Thanks Katerina, I hope you enjoy it! Delicious! PB, banana, and chocolate are so good together. I agree Dorothy, thanks for stopping by!